Foreign Affairs Minister Chrystia Freeland: "The Canadian objective from the outset has been to maintain Canada's privileged access to the U.S. market." The leaders of all three countries signed the deal last fall but its formal ratification remains uncertain amid political jockeying in and between the U.S. and Mexico. Freeland is hinting the government isn't worried about the way forward, saying Canadians can continue to enjoy the benefits of the existing 25-year-old North American Free Trade Agreement, which remains in place. That wasn't the case with recently completed free-trade deals with the European Union and 10 Pacific Rim countries because they had to be ratified before Canadians could enjoy access, she said. "NAFTA is an entirely different situation," she said after a Tuesday cabinet meeting on Parliament Hill. "The Canadian objective from the outset has been to maintain Canada's privileged access to the U.S. market, which is so valuable to all Canadians. We have been quite willing to consider modernizations, improvements, but our core objective has always been to keep that access in place." The apparent laissez-faire positions of Canada and Mexico ignore one other fact: that President Donald Trump could serve a six-month notice he's pulling out of NAFTA. A Canadian ratification deadline in June is looming because Parliament will break then and won't reconvene until after the October federal election. Some leading U.S. Democrats in Congress say they won't approve the new trade agreement unless Mexico implements tougher labour standards that elevate the rights of workers and their unions. 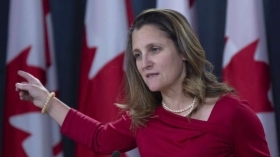 Freeland reiterated that U.S. tariffs on Canadian steel and aluminum, officially imposed on national-security grounds when negotiations on the new treaty were at a delicate point,, are "absurd" and "illegal" but she stopped short of saying that lifting them would be a precondition to the government ratifying the new continental trade deal.